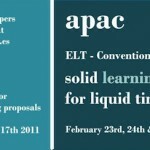 One more year, the SpeakApps project was presented at the Catalan Association of English Teachers (APAC) ELT annual convention. Celebrated at the Universitat Pompeu Fabra, in Barcelona, the meeting took place from 23th to 25th of February and gathered together opinions, thoughts and reflections of nearly the whole regional community of English teachers. Under the headline SpeakApps: Resources and Applications for Developing Oral Skills Online, the UOC team was in charge of one of the several lectures included in this edition’s programme, and the project attracted the attention of a large audience. 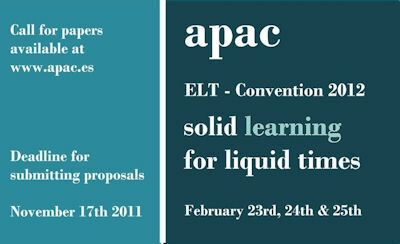 The APAC meeting motto for this year was Solid learning for liquid times, so that much of the topics centered about the revolutions that have been driving the language teaching and learning from the chalk and blackboard style to the highly technological classroom of the 21st Century. Born in 1986, APAC is an organization open to all teaching professionals of whatever sphere or level that offers several support services —magazine, forums, social networks, etc.— to all its members.